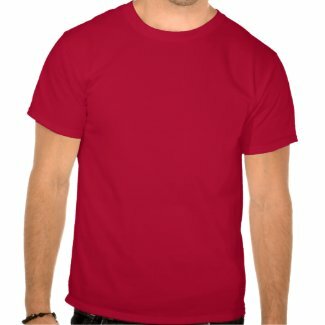 Around the globe there are many who sell their creative work to support themselves. Many times in third world countries the artisans do not receive adequate monetary compensation for their beautiful work. It is unfortunate that some large corporate organizations who can afford to pay higher sums, purchase the artistic work at very low prices and re-sell the work for quite large profits. The organization 1000 shillings is working to highlight and showcase the beautiful bead work of several Ugandan woman at fair trade values. This wonderful organization was established to offer these women a platform to sell their beautiful products on the world market. Each sale will help the artisan to build towards establishing their own local business. This in turn will improve the life of the children and families of each woman. These sales also will improve the local economy thereby benefiting the entire community. With an improved local economy there is bound to more access to education/schools, improved infrastructure and more healthcare. The beads being sold are all limited edition unique pieces of jewelry. With this being a season of giving we all should consider purchasing gifts that can truly make an impact!! You can learn more about the artisans, their beautiful jewelry and the great work being done at the 1000 Shillings webpage. Duafe Wrap up – Wear a scarf! I love scarves!! Wrapping one around my head or neck is such a great feeling for me! It just adds that little touch of duafe for me! I am always on the hunt for new ways to drape or wear a scarf. Some of this probably is rooted in being a native of the state of New York where we have soooo many cold days. As a young girl I always admired how the beautiful women in my life would make winter scarfs look GOOD!! I think it has become a quiet obsession for me. So with all that said when I came across the video below I was soooo happy!! It is like scarf heaven for me. So much duafe to imitate and try!! I just love the presentation … how did she synchronize these blocks????? I hope you enjoy it as much as I did! Are you a scarf lover? What is your favorite way to display your scarf Duafe?? This blog post is dedicated to all the little girls with curly hair. 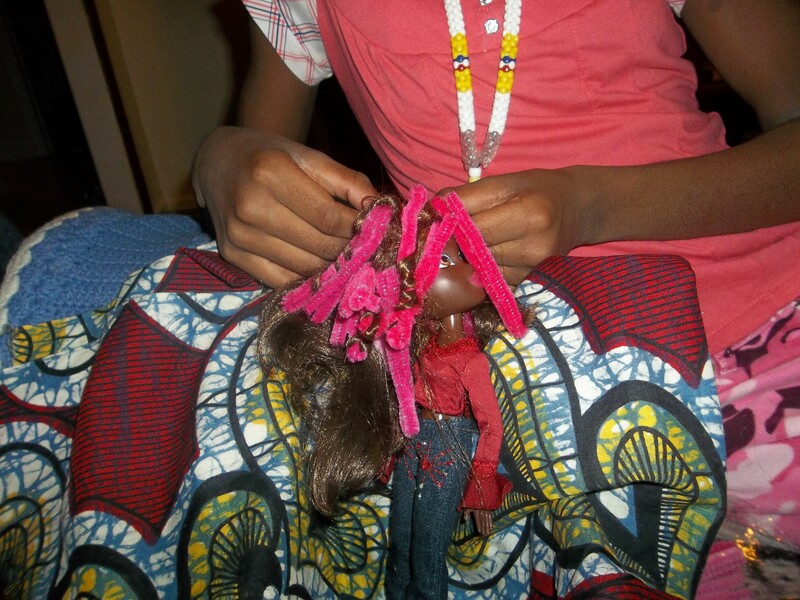 As mom to a young girl of African descent I have had many discussions about hair. When she first went to school, my daughter soon began asking questions about blonde and straight hair. We talked at length about the differences between her best friends hair (blonde, straight , unbraided) and her hair ( curly, black and braided). I have always taught her that hair comes in many, many varieties. This fact means that there are many different ways people will style their hair. My daughter can now admire many different styles without any envy that her hair is not exactly the same. This makes me happy. The “hair prep” steps needed for this Afro creation were pretty simple….twirl the hair, curl it up on pipe cleaners and dip in really hot water. 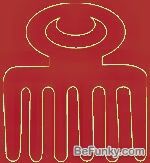 We were able to complete the style but we did not get a true Afro – maybe because her hair was so long. My daughter loves the increased texture so all is well in the land of “lil Duafe” which makes me smile and oh soooo happy to be in the mommy “hood”. How have you explained hair differences to the little girls in your life? Have you received questions or statements of envy for another childs hair or styles? As a fabric lover and quasi cloth collector I immediately thought of Kente for the letter K. Kente cloth is a traditional woven cloth orginating in Ghana, West Africa. This beautiful colorful fabric is handwoven by the Akan people which includes the Ashante, Bono, Fante, and Nzeme. 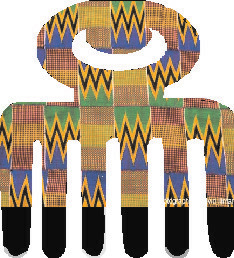 Historically Kente was worn for very important occasions and was used by royalty and kings. In more modern times, use of this amazing fabric has become more widespread but it continues to be looked upon as special. Here in the United States many African Americans adorn their graduation robes with a strip of Kente cloth as a cultural signal of the special significance of the day. Kente cloth is hand woven and stands out because of the brilliant multicolored geometric patterns. These patterns have names and the people of Ghana choose their cloth by not only the color and pattern but also the names given to the unique designs. The Kente cloth names are derived from several sources including proverbs and historical events. Another source of significance within the Kente cloth is the colors themselves – each color being used has significance For example Black represents maturation / intensified spiritual energy, blue represents peacefulness/ harmony and love. I find this cloth to be amazingly beautiful. Because of cost I have only a few strips but have supplemented my fabric stash with printed Kente. The printed version of course, does NOT have the same quality or level of significance as the woven fabric but gives me a beautiful reminder of the original Duafe from Ghana. 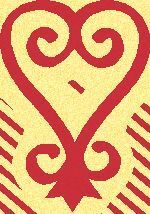 I would like to give a BIG shout out to my dear hubby Kamau here who created this beautiful Kente Duafe design above at last minutes notice….Aren’t I lucky to have an artist right here at my beck and call!! I am so appreciative! 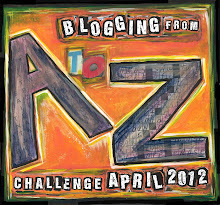 Feel free to drop by his blog Kamgraphix and invite him to join in the A to Z challenge fun!! I have always loved the beautiful fabrics that come from the continent of Africa. 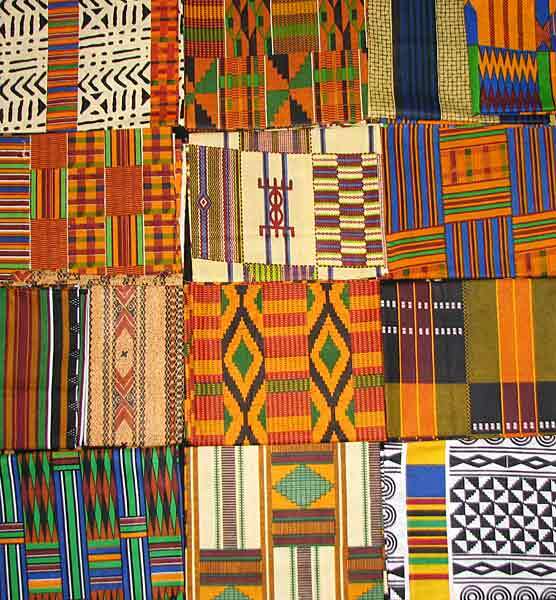 Kente Cloth, Mud Cloth, Kuba Cloth and so much more . Each has its own beautiful qualities and history to how it is made. It is my dream to become a true collector of these beautiful woven fabrics and maybe one day travel the African continent to see the artisans in each country that make these fabrics. 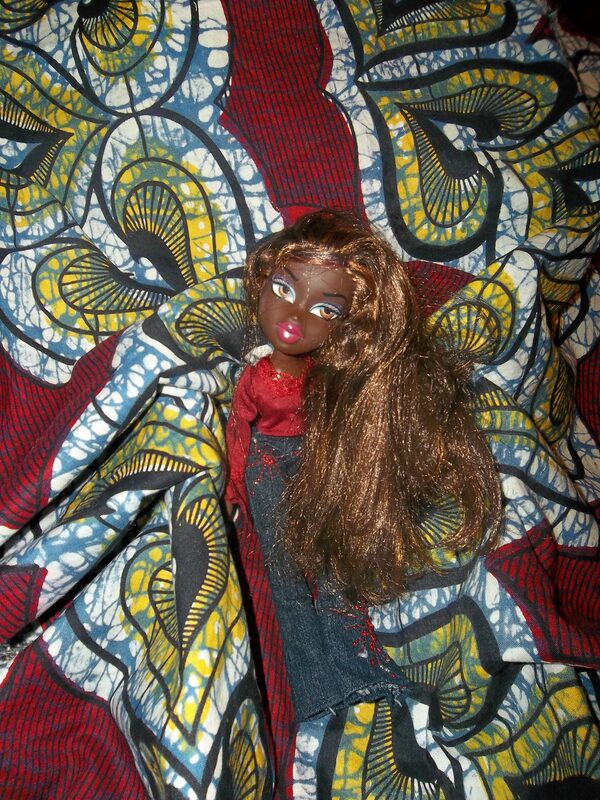 While surfing the web recently I came across the most unique use of African fabric that I have ever seen. The designer Serge Mouangue has developed a beautiful clothing line Wafrica featuring designs that have a Japanese flair but are made with fabrics from the African continent. Using this unique cultural combination this Cameroon born designer has developed an amazing line of designs. Did you hear- Sept 3rd is the date – Dallas is the place – Our Nations 1st Natural Hair Parade and Festival WHOO HOO! This is a beautiful event that is just making me smile from ear to ear! ERYKAH BADU & INSTITUTE OF ANCESTRAL BRAIDING have joined forces and are sponsoring a Parade to celebrate natural hair beauty on Sept 3rd – Labor Day. They picked this day because it is a Labor of Love (so sweet) I am just so excited to hear about this amazing expression of Duafe. I wish I could be there to join in the warm and beautiful vibes that are sure to be in the air during the parade and festival! If you live in the Dallas, Texas metro area I encourage you to join this Duafe Celebration. One of the goals of this event is to offer the community an opportunity to come together in a positive and uplifting environment. Local groups, churches and businesses are encouraged to participate. Be sure to check out the video below from Ms Isis. It is due to her dedication to continuing to broaden the horizons in natural hair care that this celebration is available to us! I salute Isis and the amazing Ms Badu for bringing this opportunity to the people! Did you know that there are Miss Africa Pageants in the United States, United Kingdom, China, Netherlands and Australia? These beauty pageants held around the world offer young women from the continent of Africa the empowering opportunity to unite and share. The pageants provide a wonderful platform for African women to express their sense of beauty and talent while representing their home country. Here are some of the recently crowned Beauty Queens giving us their unique expression of Duafe. As we march into the patriotic holidays for our great nation over the next two months I would like to share some thoughts, memories and photos. Memorial Day, Juneteenth and The 4th of July are generally a time of celebration and a time to remember our brave men and women that have fought for true freedom! This beautiful photo was taken of the families celebrating the return of the brave soldiers of the 369th Infantry as they marched uptown in NYC! The soldiers were returning from their service in France. I love the smiles on the faces…so proud of these brave men! The African-American community has offered many citizens who served bravely in all the wars this nation has engaged in. We must continue to remember ALL the men and women who have served bravely to defend this nation. Sharing these old photos and stories with the next generation will give them a clear picture about the contributions many Black men and women have made to US history! I believe this is the spirit of SANKOFA….helping the next generations reach back and hold onto their history. I have been privileged to have many stories and pictures passed on to me throughout my life. Who are the people who have served our great nation in your family? Do you share stories with the youth? Do you have a member of the family serving now? I would love to hear about them!! Celebrating Women in March – Amazing Duafe! Dedicating this post to the celebration of Women during the Month of March! Ladies we all must remember that Duafe is a special thing ! We know that being a woman is so much more than wearing a skirt or curing our hair! As women God has given us very special gifts! We nurture the world and make it beautiful in sooo many ways…..THIS is OUR POWER! Remember that anything that interferes with your ability to nurture self and those you cherish ……it is wrong! Stay positive, peaceful and beautiful! Are you planning anything special this month to celebrate women? I would love to hear about it ….pls share here!